It is common for racehorses to race at different tracks. Also in daily training, different track condition differs a lot such as dirt, turf, woodchip or hill. Especially when race at the overseas track, it is very important to grasp track character and how different it is from the home course. 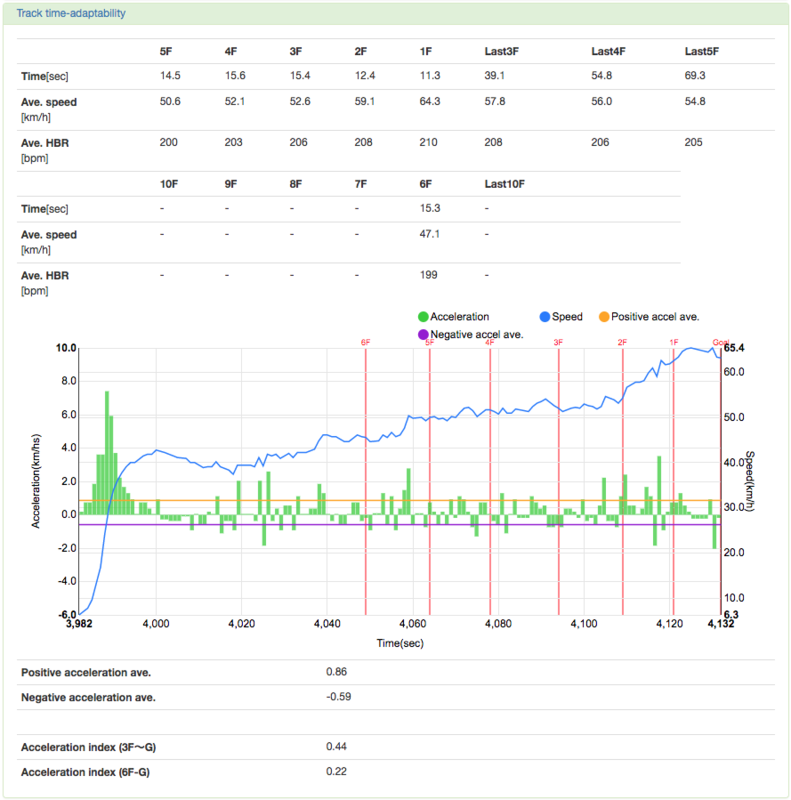 The Horsecall system analyzes acceleration profile during 5 furlongs to the winning post. 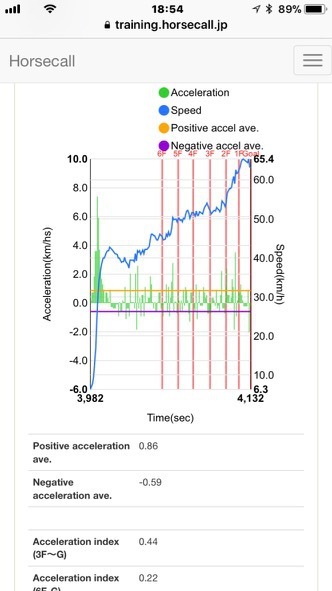 Speed and acceleration chart indicates speed and positive/negative acceleration. The chart indicates how the horse is accelerating forward and decelerating by landing his legs. Even if two horses shows equivalent furlong section time, features of acceleration of the horses may differ from one to the another. Depending of track condition, whther is is good solid one or heavy one, positive and negative acceleration chart will become very different. Acceleration data is saved separately in conjunction with displayed chart. By comparing the acceleration feature of a good solid track and a heavy wet track, it becomes possible to compare horse's track condition aptitude. In case of oversea race track, it is possible to evaluate track condition by comparing the acceleration and speed data with the data at the home track. It is also possible to examine the condition of the horse through evaluation together with cardiopulmonary and fatigue data . 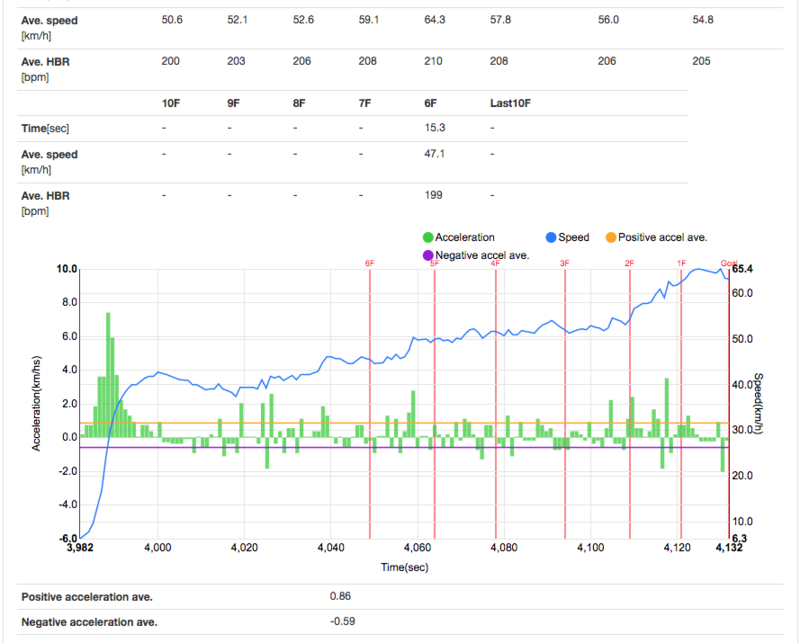 Work-out hard training at the same track with equivalent speed level, acceleration profile with cardiopulmonary performance and recovery progress will become effective parameter to evaluate overall horse racing condition.